It’s been suggested, at various times, that ancient humans had knowledge and use of unseen powers, forces and energy fields. Could these unseen forces and fields consist of electromagnetic frequency waves and particle fields that make up the EM Spectrum? This is not a simple question to answer. What evidence exists, and what kind of evidence may come to light, to support such a claim? There is no question, that as it has always existed, the EM Spectrum is a naturally occurring part of our environment, comprised of a continuous sequence of electromagnetic energy arranged according to wavelength or frequency, as generated by particle motion (vibrations) and pulses created from many sources. There is also no doubt that many ancient cultures had a connection with nature and natural forces that was fundamental and could only be described as intimate and profound in ways we moderns can merely attempt to comprehend. This article will examine some of what evidence and possible evidence exists, that suggests ancient knowledge of the EM spectrum, examine its scientific foundation and whether it can be used to form a hypothesis and hopefully, be applied to solving this mystery. From ancient times to today, humans have demonstrated an inherent curiosity and the desire to understand mysterious and odd phenomena, signs and images. For the vanished civilizations and cultures of Egypt, Sumer, and other early civilizations, and actually for the entire lapsed time of humankind, there remain many unsolved and unsettled images, messages, texts, tablets, artefacts, inscriptions, engravings, schemes, and phenomena that suggest a connection to unseen forces. As modern society explores the mysterious meanings of certain universal cultural myths and symbols, so too may have humans from earlier civilizations, who repeated and venerated various motifs throughout time and traditions. The origin and meaning of these mysterious symbols may have, in fact, remained unknown even to the ancient cultures that utilized them, the ancients knowing only that certain signs and symbols were important clues to even more ancient lost knowledge and powers. It has been noted by many that the designs and motifs of ancient architecture often reflect and in many ways try to mimic the patterns, signs and signals found to occur naturally in our environment. Most significant, for the purposes of this report, are the many variations of the basic waveforms, be it sine wave, saw-tooth wave, box wave or the endless variety of spirals and wave forms that adorn ancient cave wall, temples, and structures and appear in architecture, scrolls, tablets and inscriptions throughout the ancient world. Below are examples of waveform symbols appearing in ancient designs and motifs that existed in ancient cultures from around the world. Fig. 1 The dragon or serpent is an ancient Chinese symbol for an unseen force. This one appears to take the shape of a box tooth wave. The ancient cultures of this world are known to have identified and utilized the forces of nature to their benefit, including water, fire, wind, and sound. Are we to believe that mankind is only now, in the past century, exploiting the waves and frequencies of the EM spectrum for the first time? I’m not so sure. And perhaps more importantly, if ancient culture did possess this knowledge, where did it come from and how was it processed? Fig. 2 Mayan Pyramid of Kukulkan at Chichen Itza has a saw tooth wave form built into its architecture. From written history it appears that many of the concepts now familiar in EM theory were explored and developed during a time when many modern high-tech investigative and detection tools and methods did not exist. But is it possible that the ability to manipulate the particles and waves of the EM spectrum was discovered and developed even earlier than written history suggests? Could it be that many of the symbols, images, architectures, and myths of ancient cultures are representations reflecting the possession of such knowledge? If, as Smutny suggests, these tapestry patterns and temple layouts are representations of fragmentary remnants from long lost science, what could have been the original source, other than a previously existing technologically advanced civilization? Of course more evidence is needed before any solid conclusions can be drawn. The oval multi-chambered configuration of the Maltese temples would allow signals formed from groups of air particles, before output, to be amplified in a second parallel opposite oval spaces of the temple. This would be analogous with a resonator. To support his theory, Smutny points to the massive blocks used for construction of the complexes, noting they are a very good resonant material. Smutny suggests a reconstruction experiment to prove functionality of the megalithic complexes, in which the roofs would be intact (buildings are currently without ceilings), and models made from concrete, or from stone in suitable scale. For testing, acoustical or ultrasound frequencies should be utilized, where wavelengths are diminished to scale. As a radio frequency engineer, I find these possibilities fascinating, and while pondering them I had a bit of a revelation: Namely, A birds-eye view of the temple structure and configurations in Malta, in many ways closely resemble an antenna propagation pattern with it’s main beam lobe, side lobes, and nulls (between the lobes). See Fig. 4. There are an infinite variety of patterns that can be generated by antennas depending on the beam width desired, distance between the antenna poles and the frequency being transmitted. However, nearly all antenna patterns have similar characteristics consisting of main beam lobe and side lobes as well as nulls and back lobe. I believe lobe was a word Graham Hancock specifically used in Underworld to describe the temple structures on Malta. And, when Hancock mentioned the unusual acoustics he encountered in the Hypogeum on Malta, I began researching anything that referred to those acoustics or a similar effect. 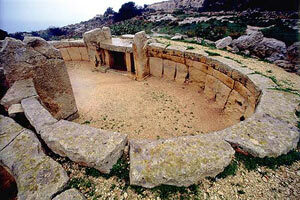 In Joseph S.Ellul’s 1988 publication Malta’s Prediluvian Culture at the Stone-Age Temples, the author describes, “Before going into the entrance, just have a look at the lintel and at the long blocks lying alongside and on top of it. Most of them, including the lintel itself, which measures about nine feet square and 18 inches thick, were scattered about in this courtyard. Almost all of these blocks had been thrown over into this yard for a distance of about 20 feet. The lintel fell on its right corner and was splintered in the fall.” Interestingly, Ellul continues, “That lintel was found resting some 30 feet to the East of the doorway, lying on some rubbish and with one of the long horizontal slabs on top of it. It happened that the upper stone had certain acoustic characteristics and was positioned so as to be almost perfectly balanced, and whenever one hit it with another stone, it rang like a bell.” That peculiarity earned it the nickname of “The Bell of Ħaġar Qim” but, during works carried out in the 1950’s, these various blocks were put back in their present places on top of the front wall, and “The Bell of Hagar Qim” was no more. Odds are, of course, this is all simply coincidence, but it poses the interesting question: Exactly what is the unique and specific temple design layout of Hagar Qim based upon? What was the impetus and influence that dictated the architectural configuration so long ago? I design digital wireless networks utilizing the EM Spectrum, transmitters, receivers, modulators and antenna. I also do propagation prediction modeling using powerful computer programs. The program creates a model showing how a location will perform using different antenna, elevation, azimuths and power settings. Sites are chosen based on how well the location propagates a signal. Again, when Hancock mentions in Underworld how the land gently dropped away for a great distance from a temple location, I couldn’t help think how ideal that is for signal propagation when designing sites that can transmit great distances. Is it possible some ancient temple locations were chosen for similar reasons? If the temple location were part of some kind of communications network utilizing the EM Spectrum, I’d say they were. Is it possible a correlation exists between the Maltese temple architecture and antenna propagation patterns? Perhaps, but much more research and investigation is needed before any firm conclusions can be drawn. Certainly it can be said that the temple layout seems to conform strikingly to the characteristics of antenna propagation patterns. If a connection were proven to exist, what would be the implications? Certainly a radical rethinking the level of technological sophistication that may have existed in ancient civilization, not to mention the question of how this knowledge came to the builders of the Maltese temples. Lets assume, for a moment, the ancient builders had knowledge and understanding of wave propagation. Perhaps early post-flood cultures possessed the knowledge and understood the purpose of unseen forces but lacked the functionality. If it was known and handed down through generations that a universal force existed that could be controlled for the benefit of all humans, would not every effort be made, no matter how futile the attempt, to resurrect and recreate that functionality? This in itself could account for the existence of many megalithic structures, about which many aspects and purpose humankind has puzzled since their very discoveries. Another example of anomalous science, which includes a possible EM spectrum connection, is the Celtic round towers of Ireland. These fascinating structures, the tallest measuring 34 meters, once numbered over 100, and dot the Irish landscape. Based on the fact that nearly every tower is at the site of a known Celtic church dating from the 5th to 12th centuries, scholars have suggested that the most probable construction period was between the 7th and 10th centuries AD. Initially, each of the towers were freestanding structures, but later, other buildings, primarily churches and monastic foundations, were constructed around some of the towers. There is probably some truth in this theory but it has also been noted that it’s possible the stability of the tower had as much to do with the door heights as anything else. Basic physics dictates that the higher you could build before making an opening in the wall the stronger the base would be. Very often the towers were filled in, even as high as the doorways. This idea that the round towers were erected and used primarily as watch towers and places of protection is strongly debated by the American scientist, Philip Callahan. In his book, Ancient Mysteries, Modern Visions, Callahan discusses research, which indicates that the round towers may have been designed, constructed and utilized as huge resonant systems for collecting and storing meter-long wavelengths of magnetic and electromagnetic energy coming from the earth and skies. Based on fascinating studies of the forms of insect antenna and their capacity to resonate to micrometer-long electromagnetic waves, Professor Callahan suggests that the Irish round towers (and similarly shaped religious structures throughout the ancient world) were human-made antennae, which collected and transmitted subtle magnetic radiation from the sun and passed it on to monks meditating in the tower and plants growing around the tower’s base. The round towers were able to function in this way because of their form and also because of their materials of construction. Of the sixty-five towers that remain as ruins, twenty-five were built of limestone, thirteen of iron-rich, red sandstone, and the rest of basalt, clay slate or granite–all of these being minerals having paramagnetic properties that can thus act as magnetic antennae and energy conductors. Callahan further states that the mysterious fact of various towers being filled with rubble for portions of their interiors was not random but rather may have been a method of “tuning” the tower antenna so that it more precisely resonated with various specific frequencies. Fig. 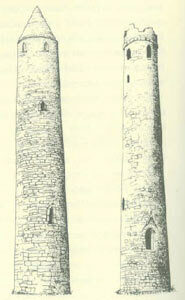 7 View of Irish Round Tower with conical cap intact. Equally intriguing is that Callahan shows that the seemingly random geographical arrangement of the round towers throughout the Irish countryside actually mirrors the positions of the stars in the northern sky during the time of winter solstice. Archaeological excavations at the bases of the towers have revealed that many towers were erected upon the tops of much older graves and it is known that many of the tower sites were considered sacred places long before the arrival of Christianity in Ireland. These facts point to the likelihood that the ancient Irish, like the Egyptians, the Mayans and many other archaic cultures understood there to be an energetic resonance between specific terrestrial locations and different celestial bodies. All across the Irish countryside particular locations were chosen, precisely designed structures were erected to gather and store various energies, and a tradition of human spiritual use of the sites arose over the millennia. While many of the round towers are now crumbling and their antenna function may no longer be operative, many visitors feel a field of energy still permeates the sites today. Were Irish monks aware of these properties and were thus prompted to build their high doors? At every tower Callahan measured, there was a direct correlation between the height of the tower door and the strength of the waves. That the highly amplified waves occur in the meditative and electrical anesthesia portion of the electromagnetic spectrum is of utmost significance. In 1963, G. Walter researched brain EEG waves from 0.5 to 3 Hz (Delta region) and found anti-infectious effects. It’s interesting to note recent research, including experiments conducted at UCLA, has shown some positive effect of EM radiation fields. Subjects who were shielded from all EM fields reported experiencing a mental breakdown, their brain no longer able to function normally. Remove the EM shielding and “normal” brain function returns. When those subjects were exposed to intensified EM fields, they reported a profound feeling of well-being. Others exposed to EM fields under controlled conditions reported hallucinatory visions similar to those reportedly experienced by Shamans or individuals in an alter state of consciousness, under the influence of mind-altering substances. Is it possible that the purpose for which many of the megalithic structures around the world were constructed was to receive or gather, process or focus and transmit or distribute naturally occurring electromagnetic energy? Could the Ancients have been aware of the medicinal and consciousness raising qualities of EM fields? There is much evidence to suggest they were. Perhaps also related to the Irish stone towers, are the many anomalous ancient stone structures, chambers and circles, found through the Northeast Unites States in New England. In the book Celtic Mysteries of New England, authors Phillip Imbrogno and Marianne Horrigan note and measure unexplained electromagnetic anomalies at stone chamber locations. The anomalies, described as “pulses” seem to occur in a specific frequency range beginning at 16.50MHz with peak signal strength occurring at1675MHz. The authors claim this could be suggestive of a “doorway” or “portal” function of the chambers, with a burst of EM energy released whenever the door is opened or shut. I would suggest that, as opposed to a “portal” or “doorway” opening to another dimension of time and space, it might be more likely that the chambers’ EM anomalies could indicate a communication channel opening for use in some way. I would suggest a series of experiments, conducted to scientific method standards, to test and measure both transmit and receive propagation properties of pre-historic sites that meet specific criteria. Such tests should utilize carrier wave transmitters and spectrum scanning receivers and software, along with spectrometers, spectrum analyzers and oscilloscopes to determine if propagation properties are enhanced by the sacred site locations and or site configuration and construction materials. Someone once said that science is like a game of darts. The surface of the dartboard, albeit perhaps infinite, represents all the science there is to know. Each theory confirmed through experiment and scientific method, represents a dart hitting its mark on the dartboard of science. While the surface of the board may have many darts in it, most of it, as of yet, remains untouched by a dart. And of course, sometimes one dart thrown may knock out a previously thrown dart from its apparently secure location. In other words, there is still a great deal of true science yet to be discovered and confirmed, and perhaps some ideas that may need to be unlearned. Above all, the perspective with which we search is perhaps the key to what we discover. An important lesson may be learned from the device known as the Antikythera Mechanism. The device, discovered over 100 years ago on the floor of the Mediterranean Sea, has been found by archeologists to be 2000 years old. Because the device suggests that the ancient Greeks had the mechanical sophistication of 18th century Swiss watchmakers, historians and scholars have generally ignored it. Could this device be evidence that a period of technological devolution, as a general trend, took place over many thousand of years in fields such as mathematics, mapmaking, mechanics and more? Can the same claim be made for wave and particle theory? Was much more known, much earlier on, than current evidence supports and the academic world is willing to accept? Nothing less than a major shift in the approach to these mysteries needs to occur in order for a full debate and examination of the facts and theories to take place within the established academic community. The fact is the Antikythera device exists, as do many other anomalies of science. No, they do not fit into the context of established history, but to fail to consider them as part of a larger picture that is far from complete does a great disservice to the pursuit of knowledge. Fig. 9. Two views of the Antikyantera Mechanism, which has been shown to be a calculator for the movements of celestial bodies. From the first time a human tossed a pebble into a pond, the dynamics, properties and laws of wave propagation were evident for him to examine and test. In air as in water these properties follow consistent traits: Greater power creates larger waves, and waves could easily be regulated and directed. Could it be that our ancestors understood the subtle properties of EM waves and particle fields and even manipulated them, harnessing the power of nature and the power of the unseen spectrum? As if to give the game away, they placed clues for us to find. All of their rituals, their religions, cults, gods, demigods, the whole of their lives, were linked to the cycles of the universe. And it is important to recognize that this is how the ancients understood the powers of the universe, through their gods. Perhaps, they did not conceive of electromagnetic power as we do, but rather as god-given signs and signals, as the power of the gods to be tapped into by humans. The History and Breakthroughs in the Development of ElectromagneticTheory. Long before any study of EM fields occurred, Scotsman John Napier, born in 1550, developed the theory of logarithms in order to eliminate the frustration of hand calculations of division, multiplication, squares, etc. We use logarithms every day in EM theory when we refer to the decibel (dB) as a measure of power. When producing and measuring power in decibels, values increase logarithmically by 3, each time you double the power in watts. His “numbering rods,” constructed of ivory, became known as “Napier’s Bones,” and comprised the world’s first slide rule. Some of his neighbors suggested that he was in league with the powers of darkness… a trait that has often been associated with successful radio frequency and microwave engineering. Ether was the hypothetical substance through which electromagnetic waves traveled. It was proposed by the Greek philosopher Aristotle (born 384 BC) and used by several optical theories as a way to allow propagation of light, which was believed to be impossible in “empty” space. It was supposed that the ether filled the whole universe and was a stationary frame of reference, which was rigid to electromagnetic waves but completely permeable to matter. Robert Hooke (1635-1703) endorsed the idea of the existence of the ether in his work Micrographia (1665), and several other philosophers of the 17th century, including Christiaan Huygens, did the same. At the time of James Maxwell’s mathematical studies of electromagnetism two centuries later, ether was still assumed to be the propagation medium and was imbued with physics properties such as permeability and permittivity. In 1887, Albert Michelson and Edward Morley performed a crucial experiment in an attempt to detect the existence of the ether. The experiment, named the Michelson-Morley experiment, shocked the scientific community by yielding results that implied the non-existence of ether. This result was later on used by Einstein to refute the existence of the ether and allowed him to develop special relativity without this artificial (and non-existent) constraint. Christiaan Huygens (1629-1695) a Dutch physicist, was the leading proponent of the wave theory of light. In Traité de la Luminère (1690), he developed the concept of the wave front. The wave theory was supported by the observation that two intersecting beams of light did not bounce off each other as would be expected if they were composed of particles. In contradiction to Sir Isaac Newton, Huygens correctly believed that light must travel more slowly when it is refracted towards the normal, although, this was not proven until experiments in the nineteenth century. In 1672, Sir Isaac Newton studied the interaction of visible light with a glass prism and first recognized that white light is actually a mixture of different colors representing the entire visible light spectrum. White light originates from a variety of natural and artificial incandescent sources, including the sun, chemical reactions (such as fire), and incandescent tungsten filaments. The broad emission spectrum from sources of this type is referred to as thermal radiation. Other sources of visible light, such as gas discharge tubes, are capable of emitting light in narrow, well-defined frequency ranges (representing a single color) that depend on specific energy-level transitions in the source material atoms. Lazzaro Spallanzani, born in 1727 in Italy, had a huge influence on many of the physical sciences, which is even more remarkable because he was an ordained Jesuit priest. Spallanzani is remembered because his Lettere sul volo dei pipistrelli acciecati published in 1794, recorded correspondence about his experiments on the remarkable sense of direction of bats. Bats use sonar to move about in the dark, which some might argue was the inspiration for radar. In 1767 the English chemist Joseph Priestly (1733-1804) showed that unseen forces followed the inverse square law. Later, the French military engineer Charles Augustin de Coulomb (1736-1806) carried out careful experiments on bodies charged with static electricity, and on magnets, and in 1794 confirmed that the attractions and repulsions followed the inverse square law. Michael Faraday, born in 1791, is credited as the discoverer of magneto-electric induction, the law of electrochemical decomposition, the magnetization of light, and diamagnetism, among many other contributions to chemistry and physics. Michael Faraday, who did his research at the Royal Academy at London, even went so far as to say that the electromagnetic field was the lowest form of physical reality. Faraday’s name is immortalized in the Farad, the unit of capacitance. In the same year that Faraday made this discovery, Sir James Clerk Maxwell was born in Scotland, the man whose brilliant mathematical interpretation of Faraday’s ideas was to become the foundation of our modern concepts of electricity, magnetism and light. He coined the term electromagnetic radiation, which is derived from the characteristic electric and magnetic properties common to all forms of this wave-like energy, as manifested by the generation of both electrical and magnetic oscillating fields as the waves propagate through space. During the next few decades, additional investigations following Maxwell’s lead produced an increasing amount of evidence that electricity and magnetism were very closely related to each other. Heinrich Hertz opened the way for the development of radio, television, and radar with his discovery of electromagnetic waves between 1886 and 1888. He succeeded in generating and performing experiments with electromagnetic waves in 1887, eight years after the death of Maxwell. Hertz produced, detected, and even measured the wavelength (approximately one meter) of radiation that is now classified in the radiofrequency range. David Hughes, a London-born scientist who was a music professor in his early career, may have actually been the first investigator to succeed in the transmission of radio waves (in 1879), but after failing to convince the Royal Society, he decided not to publish his work, and it wasn’t recognized until many years later. Nikola Tesla is most famous for conceiving the rotating magnetic field principle known as “alternating current,” allowing for the current long-distance electrical transmission system. And interestingly, in Colorado Springs, Colorado, where he stayed from May 1899 until early 1900, Tesla made what he regarded as his most important discovery: terrestrial stationary waves. Through this discovery he proved that the Earth could be used as a conductor and would be as responsive as a tuning fork to electrical vibrations of a certain frequency. He also lighted 200 lamps without wires from a distance of 25 miles (40 kilometers) and created man-made lightning, producing flashes measuring 135 feet (41 meters). At one time he was certain he had received signals from another planet in his Colorado laboratory, a claim that was met with derision in some scientific journals. And, on a historic day in December 1901, Guglielmo Marconi, determined to prove that wireless waves were not affected by the curvature of the Earth, used his radio system for transmitting the first wireless signals across the Atlantic between Poldhu, Cornwall, and St. John’s, Newfoundland, a distance of 2100 miles. In 1912 Marconi patented the first wireless receiver and as they say, the rest is history. In addition, I’d like to thank the Three Geese in Flight bookstore in Kingston, NY for providing invaluable source material for this article and my sister Debra for her assistance in editing.